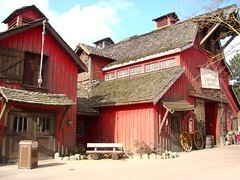 restaurants in Frontierland: which one is the best? Which restaurants in Frontierland is the best? Get out where you have to eat.... Which restaurants in Frontierland is the Yummiest? • Pasta, fish, salads, wraps, chicken wings and for dessert Chocolate Pies, Crepes. • Used our Half Board Plus vouchers in this restaurant to please your children...You are not here for the food (nothing special and drinks are not included) but for the show and the characters. • The bill could be expensive: for 3 courses, 32€ for adults and 16 €/child. • Good for junk food: pasta, pizza, garlic bread, drink and fruit. Maybe the cheapeast restaurant (10 €). • Think about the early hours (before 12:00 or after 13:30). • Drink or a small snack (hot-dog). Unpleasant with kids. 4. Looking for a cosy restaurant in winter or western atmosphere ? • Half barbecue chicken, texan platter, burgers, potato wedges, soup, spare ribs, with western band playing country and western music.... You are in the far west....near the fireplace in winter. • Maybe the best counter service in Disneyland Paris restaurants (10& euro;/burgers, chips and drink). • Also, a large outdoor eating area for good weather days. Don’t go there during the peek times (12:00-13:30 and 19:00-20:30). • Used our Half Board Standard Meal vouchers in this restaurant. 5. You don’t mind to queue up in a Mexican atmosphere? • Chilli con carne with nachos, Taco salad, chicken wings, chips, fajitas: less than 10 €. One of the cheapest restaurants and directly opposite to the Big Thunder Mountains rides! 6. You don’t mind to queue up in a western atmosphere? • Meat eater welcome in a Wild West saloon: T bone steak, ribs, entrecote steak served by waitrers. Of course, you can find something else as the fish, dessert and ....good bottles of wine. • In winter, the center-grill is open: a good place to get warm! • Maybe the cheapest table service restaurant (25 €). Bon appetit in the restaurants in Frontierland!